Your contributions help us in our goal of recovering the endangered Attwater’s Prairie-Chicken and restoring native Texas coastal prairie for the benefit of present and future generations. You may donate to or become a member of Friends of Attwater Prairie Chicken Refuge online or by mail by choosing an option below. The Friends of Attwater Prairie Chicken Refuge (Friends) not only serves wildlife, but the people and communities around it. By donating or becoming a member of the Friends, you are supporting a local refuge, and helping them find ways to accomplish its mission and contribute to the quality of life of the entire area. Additionally, your funds will play a part in environmental education programs in schools and communities. As a non-profit, 501(c)(3) organization, the Friends welcomes your support in enhancing and promoting its efforts to recover the endangered Attwater’s Prairie-Chicken and to restore the native Texas coastal prairie for the benefit of present and future generations. Join us, FWS, Texas Parks and Wildlife department, Natural Resource Conservation Service and other conservation organizations, in our efforts to restore the prairie and bring back the Attwater’s prairie chicken. Your membership will assist us in providing education and awareness programs for elementary, middle and high school students and for adults of all ages. 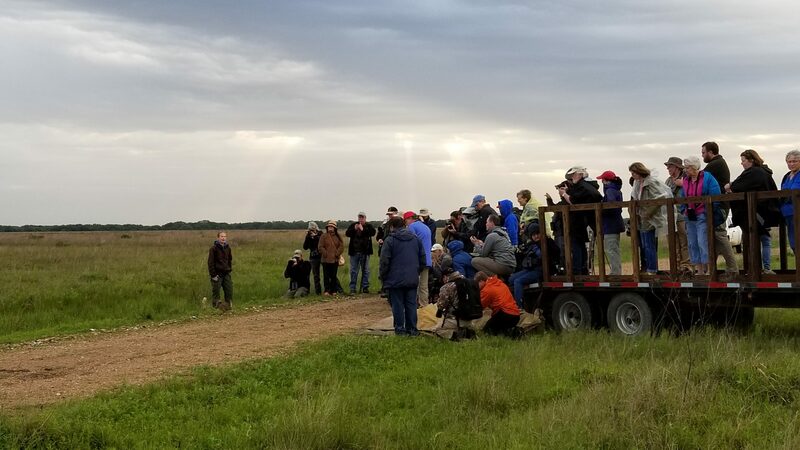 In addition to supporting many of the refuge’s efforts, including the annual Attwater Prairie Chicken festival, Booming and Blooming, and the fall open house. Friends members help with grant writing, merchandise sales and volunteer coordination. We support operating activities of the refuge as well as advocate for issues that support the Attwater Prairie Chicken National Wildlife Refuge. Join today! Please click here to fill out a membership form and return by US Mail or follow the link below to pay securely through PayPal. You can support the Friends of Attwater Prairie Chicken Refuge every time you shop Amazon at no extra cost to you. Amazon donates 0.5% of eligible AmazonSmile purchases to charitable organizations. Simply go to Friends of Attwater Prairie Chicken Refuge Smile or AmazonSmile and designate Friends of Attwater Prairie Chicken Refuge as the organization you are supporting, and begin shopping! Be sure to bookmark your page so that all future Amazon shopping and purchases are from Friends of Attwater Prairie Chicken Refuge Smile! Your contributions will help us in our goal of recovering the endangered Attwater’s Prairie-Chicken and restoring native Texas coastal prairie for the benefit of present and future generations. The refuge always needs good volunteers. Two RV sites are available for volunteers interested in committing to a minimum of two months. All utilities and hook up are provided for a 24 (couple) or 32 (single) hour per week commitment. Local volunteers interested in helping the refuge can call for more details. We need help with maintenance and construction projects, computer/technology projects, biological surveys, administrative work, environmental education programs and visitor services. All volunteers are expected to sign a volunteer agreement and commit to at least 40 hours of volunteer work individually, or in combination with a group. Current projects include: fence line/brush clearing; acclimation pen construction, removal, and storage; gathering baseline data for reptiles, amphibians, small mammals, and birds; organizing slides, filing system, and catalog files; acid rain monitoring; radio telemetry tracking; developing display and programs for schools; and visitor services. Volunteers are most needed during the spring, summer, and fall. Contact the refuge for more information.